Herald: A tribute to their teachers ! A tribute to their teachers ! Higher Secondary School, Quepem, celebrated Teachers’ Day with full zeal and enthusiasm. The students, in fact, started expressing their love and gratitude towards their teachers a week before the celebration, by using the morning talk during the assembly as an opportunity to thank the teachers for their hard work. The white boards highlighted the need to be thankful and appreciative of the good things the teachers do. The theme chosen for the day was ‘YOUR SMILE…A COZ 4 MY SMILE’ with a PJ+. Everything was detailed with a smiley emoji. The day commenced with a thanksgiving mass followed by the programme. 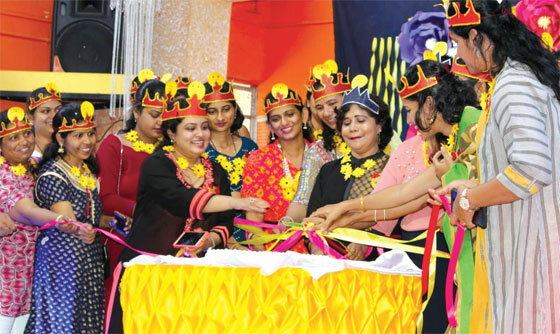 The students put together a scintillating cultural show that incorporated ‘Little Expressions’ in the form poems and short messages rendered to express their love and deep sense of gratitude. This was followed by some dance performances. The teachers joined in the fun on stage with a number of fun games organised by the students. These included Vocabulary Test, Longest Pencil Flakes and Heads On! A live band performance kept the spirits up with their music. Other events of the day included cake cutting, Smiley King as the Special Character, address to each teacher, fashion show relating to teachers, a PTA performance and a thank you song. The programme concluded with the Principal’s Address. Fr Tamatur Cardozo, Rector/ Principal, extended his heartiest thanks to all the students on behalf of the staff. The PTA offered the buffet for the staff.